ODC/Dance marked its 44th home season with the annual yearly program at Yerba Buena Center for the Arts, ODC/Dance Downtown. Weekend one welcomed the return of last year’s boulders and bones, choreography by Brenda Way and KT Nelson, while the second weekend brought a set of world premieres – Nelson’s Dead Reckoning and another Way/Nelson collaborative project, The Invention of Wings. The curtain rose on Dead Reckoning to immediately erupting action, like the start of a race. Dancers turned, jumped and dived around the stage in a swirl of movement, resembling fireworks. Legs kicked outward and arms pushed through space; Nelson’s choreographic vocabulary an unexpected combination of punchy and sculptural. Dead Reckoning reads as an A-B-A structure, with a fast, slow, fast section breakdown. Throughout each of these chapters, the motion was continuous; every instant feeding seamlessly into the next. By avoiding stops and starts, Nelson connected the dance’s sub-sections and kept the forward motion going. While that connectedness and continuity was a great achievement in Dead Reckoning, the middle section (the slow one) had its challenges. The movement intention definitely carried through and it had some beautiful solos (particularly by Jeremy Smith, Josie G. Sadan and Katherine Wells) but the functionality and purpose of this lengthy meditation was unclear. In the last movement of Dead Reckoning, we were treated to a pas de deux, danced by Natasha Adorlee Johnson and Joseph Hernandez, one of ODC’s most exciting pairings. Their pas de deux was brief, but these two dancers are simply electric when they are on stage together. Design-wise, lime green ‘snow’ (concept by ODC company dancer Yayoi Kambara) was utilized during the whole dance – falling from the rafters and from the hands of the dancers. By the end of Dead Reckoning, the stage was bathed in this snow, reminiscent of Pina Bausch’s Carnations. theatrical was constantly arising. 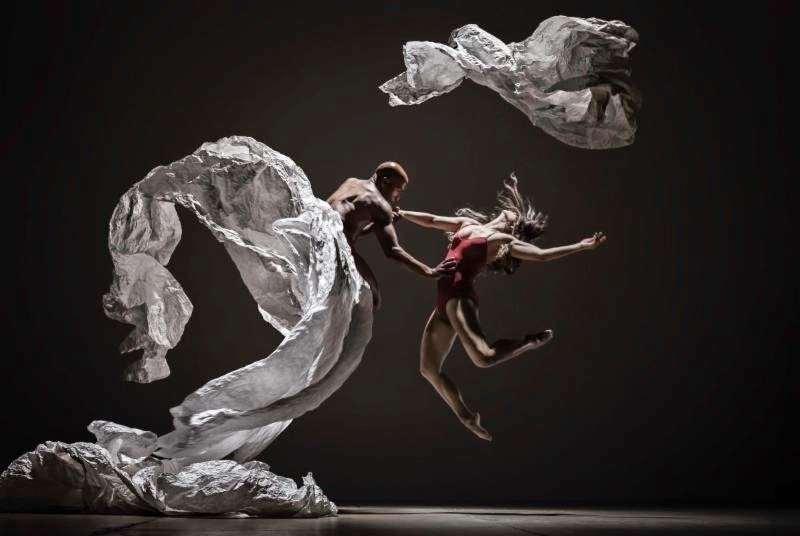 Blood red fabric panels, men in black skirts being wheeled around the stage, numbers being painted on backs, a torn and fragmenting video screen, giant falling ribbons, figures clad in large white paper, a dancer rising out of the pit with a giant, flowing skirt. Even a leaf blower made an appearance. Events and scenes were constantly shifting and evolving, which again spoke of the initially established impermanence as well as the notion of the unexpected. Sometimes The Invention of Wings felt like a religious ritual; sometimes, a boy-band performance. Sometimes there was amplified vocalization and counting; sometimes a comment on corporeal presence. Putting all these ideas into the same piece can totally work; collage and layering can be very powerful in performance. But at the same time, with an abundance of different elements, it can be difficult for a dance to find its true identity. This core essence did prove elusive for The Invention of Wings.